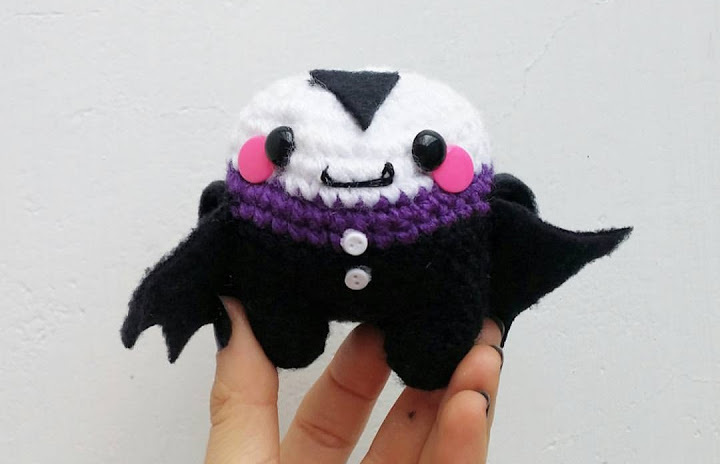 Halloween amigurumi Vampire. Learn how to make a little amigurumi vampire with this video tutorial! To join both legs together and create a gap in between the legs we will crochet a square. Sc In each st from chain, sc in next st from leg, turn. Sc in next 3sts from chain, ch 1, turn. Sc in each of the 3sts from chain, sc in next st from leg, turn. Fasten off. Weave the ends. 1) Sew the square to the next leg with tapestry needle and make a sc in each st around (36 sts) this will become round 1 of the body. Finish stuffing the body and fasten off. Weave the ends. Cut a cape with the black pressed felt and a widows peak for the forehead of Mr. Vampire. Embroider a pair of teeth and you are done!